Protecting your privacy as a person using a verified identity is very important to the Department of Internal Affairs (DIA). Our privacy statement in relation to your verified identity is set out below. In this privacy statement you will see references to "verified identities". Verified identities are applied for and used as part of the RealMe service to give you a way to prove your identity to participating service providers via the RealMe service. This privacy statement covers our treatment of your personal information if you apply for a verified identity so as to be able to verify your identity online. Information collected in applications for the issuance, renewal, cancellation or amendment of verified identities is done so in accordance with the Electronic Identity Verification Act 2012 (the Act). In the Act, a verified identity is referred to as an “electronic identity credential”. For the purpose of applying for the issue of a verified identity, you may start your application on any computer or mobile device. You will then need to have your photo taken by an approved photo-taker, including participating PostShops in New Zealand or an authorised mobile application if eligible (depending on method of application). You may also be asked to provide additional documents to support your application. These documents will be scanned and provided to us with your application. If you choose to apply for a verified identity at the same time as you renew your New Zealand passport online you won’t be required to get your photo taken or supply additional documents for your verified identity application as we can use the same information you supply for your passport application. If you are relying on your passport, you will be asked to enter passport number and full name. If you are relying on New Zealand citizenship, you will be asked to enter your citizenship certificate number and full name. If you are relying on your immigration status, you will be asked to enter your foreign passport number, or Immigration New Zealand visa or permit number, and full name, date of birth, place of birth and gender. If you are relying on your birth registration, you will be asked to enter your full name, date of birth, place of birth, gender, mother's name at birth and your father or other parent's name (if applicable). In processing your application for a verified identity, we need to retrieve personal information relating to you from DIA's passports and/or citizenship databases and/or registers of births, deaths, marriages, civil unions and name changes, and/or the Ministry of Business, Innovation and Employment’s immigration databases, for the purpose of verifying your identity. That personal information may include your full name, details of name changes, date of birth, place of birth, gender, photograph, and your existing passport or citizenship unique identifier, immigration client identity number or birth registration number. The IVS retrieval of this personal information is conducted in the context of information matching programmes authorised by the Act and the Privacy Act 1993. We may also retrieve further immigration information from the Ministry of Business, Innovation and Employment’s immigration databases, such as any alerts or warnings, to check if they relate to your identity. Where you have given contact details to the RealMe login service, we may retrieve those details for the purpose of communicating with you (whether in relation to the application process or subsequently). When creating your verified identity, we store your name(s), gender, date of birth and place of birth. When you use the RealMe service with a participating service provider, it is some or all of these attributes that, with your consent, are released to that service provider. As part of the verified identity application process, your photo will be taken and stored with your application. We use this photo to assist in the confirmation of your identity by matching it with the photo we retrieve from DIA's passports or citizenship databases, or from the Ministry of Business, Innovation and Employment’s immigration databases, or from the identity document you are asked to provide, or against your previous IVS photo. The two photos will be compared by up to three DIA personnel. If an application receives two negative determinations on the photos (because they are not considered to match), your application will be held or declined and you will be notified accordingly. If you choose to apply for a verified identity at the same time as you renew your New Zealand passport online your passport photo will be stored with your application. The photo taken during the application process, or retrieved from DIA’s passports database, will be stored for future one-to-many matching, for the purposes of protecting individuals' identity and detecting fraud. We do not store the photo we retrieve from the citizenship or immigration databases, or from the identity document that you are asked to provide, beyond the period required for photo matching. The photo retrieved from passports is only stored if you choose to apply for a verified identity when you renew your New Zealand passport online, otherwise it is not retained beyond the period required for photo matching. Kiwibank and other approved photo-takers will capture and store your image only for as long as required for the purpose of supplying this image to us. If you are eligible and choose to use RealMe digital photo capture services, your photo and video/frames of your liveness test will be stored within the application server to allow for automated facial recognition matching, reference by DIA for assessment of your application, quality assurance and other duties to support the Identity Verification Service. Your captured image and liveness video may also be reused to retest biometric facial recognition thresholds to better improve our service. The statistical information referred to above will be viewable by website administrators and certain members of our staff via analytical tools like Google Analytics. If you do not provide the required information referred to above, you will not be able to use a verified identity to verify your identity online. You do, however, remain free to transact with and receive services from participating service providers in the offline environment. Your use of a verified identity is optional. Please note that it is an offence to make false or misleading statements, or to provide false, forged or falsified means of identification when applying for a verified identity. to detect and prevent fraudulent or other unlawful uses of verified identities or related services. When you use a participating service provider's online service that requires verification of identity, that service provider's online service will ask you to prove your identity and if you wish to do so online will redirect you to the RealMe login service to do so. When you login with the RealMe login service, the RealMe login service will send a unique number to us. We use that number to check, automatically, if your verified identity exists. The RealMe service then retrieves your verified identity and asks you whether you consent to your identity information being sent to the participating service provider. If you do agree, the RealMe service will then redirect you to the participating service provider and your identity information will have been sent to that participating service provider. If you consent to share your verified identity information with a participating service prior to completing your application for a verified identity, RealMe will automatically share your identity with the participating service after application has been approved and the verified identity is issued. RealMe may also share pre-verified information (Name, Date of Birth) to a participating service you consent to share that information with, once you have taken your photo with the RealMe Now App and a positive 1:1 Facial Recognition comparison has been made between the photo you took and your passport photo. DIA will not otherwise disclose your personal information to any other organisation (unless required or permitted by law), nor use your information for marketing or any other purpose. As part of your RealMe information, we hold a record of where you have used your verified identity, and the time and date that your attributes were disclosed to a participating service provider. (Access to this information is strictly controlled by the Act.) We do not hold information about the transaction that you performed with any service provider. When your verified identity is active or expired, you are able to view your activity record through your RealMe account, unless technical or other practical reasons prevent this. Your activity record will also include information about instances where our personnel or other authorised persons have accessed your verified identity record or activity record (except in limited circumstances, such as where providing access to that information may prejudice an investigation, or for technical reasons). We have procedures in place to prevent loss, unlawful access, use, modification, disclosure or other misuse of your information, consistent with good practice and as required by relevant law and policy. Particular care has been taken to ensure that only certain people with specific roles and authorised access levels are able to view your identity and transaction-related information and only for specific related purposes. Using your verified identity generates a session (non-persistent) cookie that you can find on your PC. It has the name: JSESSIONID. This cookie expires when you close your browser and does not store any personally identifiable information. apply to have your verified identity name changed. Under the Electronic Identity Verification Act, you have the right to access and to request correction of your personal information provided to us. 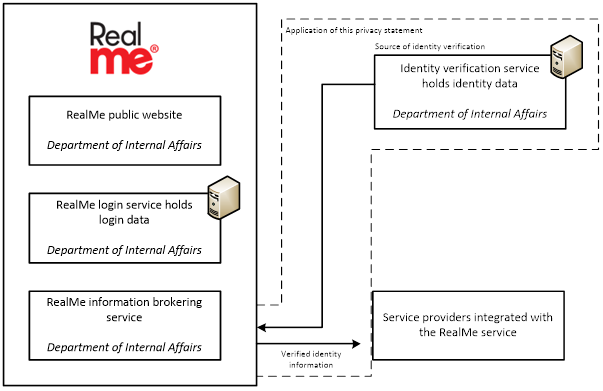 If you wish to see the personal information we have stored in connection with your use of your verified identity, or if you wish to request correction of such personal information (and you are unable to do so by logging in and accessing the manage your identity page), please contact the RealMe Help Desk. The RealMe Help Desk will refer you to our personnel who may require proof of your identity before being able to provide you with this information. While we do not expect this to occur, should you discover that one or more of your verified identity attributes is incorrect, please contact the RealMe Help Desk as soon as possible. The RealMe Help Desk may need to refer you to the relevant part of DIA or other agency that was the authoritative source of your identity information. When your verified identity expires, or is cancelled following an application by you for its cancellation, we will retain your verified identity records (including your verified identity attributes, photograph and activity record) for a prescribed period as per the Public Records Act 2005. When this period ends, we will delete your identity records. This period is prescribed in regulations. If you choose to renew your verified identity within that period, we will reactivate your previous verified identity. This will assist you to continue to verify your identity with participating service providers with which you have previously used your verified identity. If, however, you reapply for a verified identity after the end of the period, DIA may require additional processes to verify your identity.